Bringing the U.S. in from the Cold. Fears of growing Chinese and Russian influence in the region may have influenced Washington to suddenly shift its toxic policy against Eritrea, including reversing its opposition to the lifting of U.N. sanctions … as a prelude to improving its own bilateral ties with the country. The Horn of Africa is in the midst of profound change. From a summer peace deal between longtime enemies Ethiopia and Eritrea to multibillion-dollar infrastructure projects, the region is transforming, providing opportunities for outside powers to enhance their economic influence. In recent months, Russia and China’s interest in sub-Saharan Africa has forced the United States to sit up and take notice — particularly with regard to activity in the Horn of Africa. All of it begs the question: How will Washington move forward in the evolving region? Peace between Ethiopia and Eritrea over the summer of 2018 has set the stage for deeper changes in the Horn of Africa. Almost overnight, the two countries agreed to set aside decades of acrimony in exchange for better ties. For landlocked Ethiopia, this improvement in relations has opened up better trade links with the outside world through Eritrea. For Eritrea, the detente has reduced the possibility of war, allowing it to devote more attention to its shattered economy, which has taken a backseat to the quarrel with Ethiopia for dozens of years. The normalization of ties has also paved the way for the Eritrean government in Asmara to make overtures to other regional capitals after years of supporting militant groups in an attempt to undermine local rivals, especially the Ethiopian government in Addis Ababa. 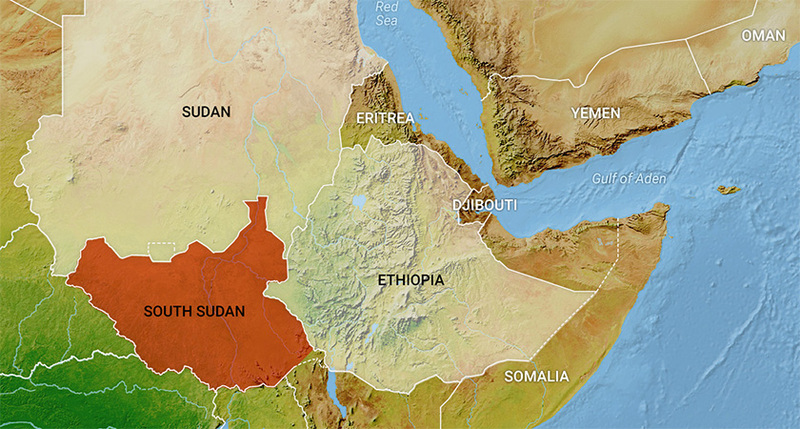 Already, Eritrea has sat down with Somalia, as well as Sudan, to improve relations. This rapprochement notwithstanding, the reality of United Nations sanctions that discouraged foreign investment continued to obstruct Eritrea’s efforts at normalization. The international body imposed targeted sanctions on Asmara in 2009 in response to a U.N. expert report that accused Eritrea of supporting Islamist militant groups in Somalia, likely as a means of undercutting its principal foe, Ethiopia, which had dispatched troops to the country. Thus, even as Eritrea recently reoriented its foreign policy, it appeared that the United States and others were unwilling to agree to remove sanctions until the government significantly improved its human rights record. Reports in early November, however, indicated a sudden shift in the U.S. position (national security adviser John Bolton reportedly played a decisive role), resulting in the abrogation of sanctions on Nov. 15. 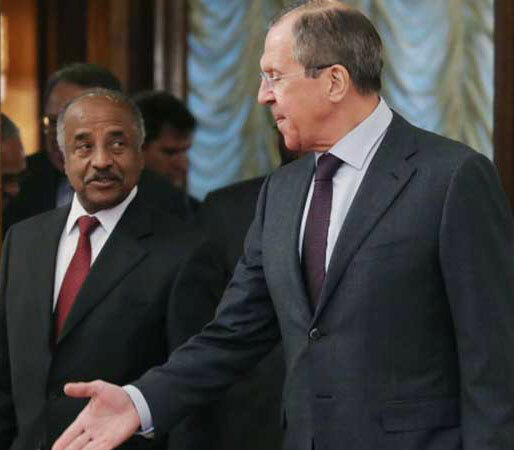 Ultimately, it is the timing that is most striking about the U.S. reversal, as it followed new Russian overtures to Eritrea that included promises to build a logistics center at one of the country’s Red Sea ports and develop closer ties. Washington also altered its policy amid worries that China has begun to use debt as a means of enhancing its influence in Africa, particularly in Djibouti. Long the site of a number of foreign military bases, including facilities operated by the United States (Washington’s only such base on the continent), France and China, Djibouti has sought to leverage its geostrategically important position on the Bab el-Mandeb strait for influence and financial gain. 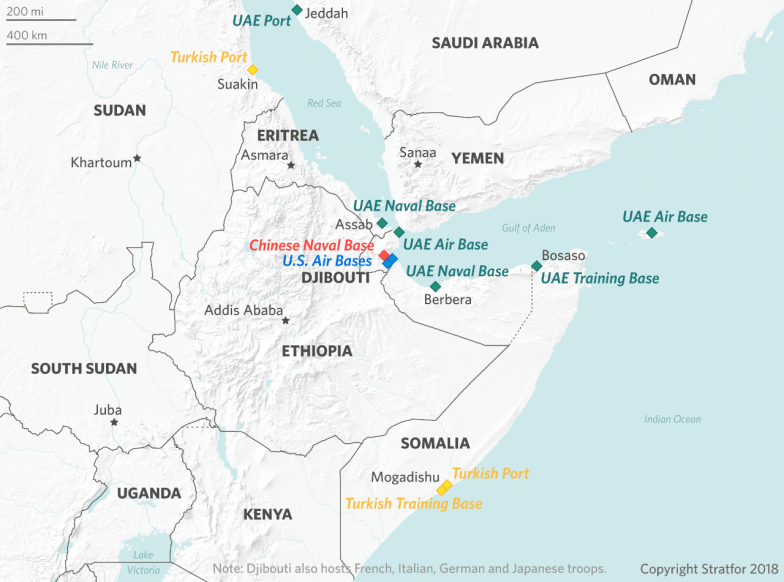 But since February, when the tiny country terminated the contract that allowed Dubai-based DP World to operate the Doraleh Container Terminal, U.S. policymakers have harbored worries that China — which holds roughly 80 percent of Djibouti’s external debt — could use its leverage to assume control of the port, potentially threatening the nearby U.S. presence. As Russia and China make inroads into the region, the United States might have permitted the lifting of the sanctions against Eritrea as a prelude to improving its own bilateral ties with the country. In fact, Washington and Asmara enjoyed relatively close ties in the 1990s and early 2000s, when Eritrea joined the “coalition of the willing” that invaded Iraq in 2003 and even went as far as offering Washington space to set up a naval base on the Red Sea. The relationship, however, soured over time due to U.S. concerns about Asmara’s human rights record, especially after authorities arrested two Eritreans employed by the U.S. Embassy in Asmara. Normalization between Washington and Eritrea could even accelerate if the realists in the current U.S. administration win out over those who prioritize greater emphasis on human rights — a topic that Asmara has yet to improve greatly. The United States has shifted its foreign policy priorities in recent months as concerns about Russia’s and China’s rise have supplanted fears about global terrorism for Washington’s policymakers. The new focus has affected U.S. policy in Africa, with a recent report indicating that the U.S. Department of Defense plans to withdraw 10 percent of its 7,200 Africa-based personnel over the next several years so it can redeploy resources to counter threats from Moscow and Beijing. Subsequent reports have suggested that at least a quarter of those withdrawn will be personnel currently focusing on counterterrorism efforts in West Africa, where the French military has deployed many troops amid its battle to contain the threat from resilient regional militants. East Africa is a region in which Washington, Moscow, and Beijing are all jockeying for position. But even as Washington plans to reduce its presence in Africa, it will maintain its focus on theaters such as Libya, Djibouti and Somalia — an unsurprising move given that local franchises backed by al Qaeda and the Islamic State continue to pose serious problems to weak governments and foreign peacekeepers. In Somalia, for instance, the federal government in Mogadishu and its ragtag forces will struggle to maintain — let alone build on — the progress made by the roughly 21,000 troops of an African Union peacekeeping force. As a result, the continued threat of terrorism in Somalia will attract U.S. military forces and resources for the foreseeable future, even if Washington is seeking a means of diverting its resources elsewhere. Moreover, East Africa is a region in which Washington, Moscow, and Beijing are all jockeying for position. The United States has traditionally relied on its security partners in Ethiopia and Kenya to combat militants and ensure regional security. But China remains a potent and growing force, particularly amid questions over its so-called debt-book diplomacy across the continent. Indeed, the Chinese Communist Party has longstanding ties with Ethiopia’s ruling coalition — something that Washington would like to reduce as Ethiopia’s ambitious and young prime minister, Abiy Ahmed, and his allies push for internal reforms to liberalize the country’s economic and political systems. Russia, too, has turned its attention in Africa in recent months, launching its most ambitious African strategy since Soviet times. Moscow has long enjoyed tight ties with countries like Sudan (owing to arms deals and overlapping ideological hostility toward foreign intervention), but Russian officials have also beaten a path to other countries on the continent such as the Central African Republic, Democratic Republic of the Congo, Rwanda and more in 2018. In fact, hundreds of Russian military trainers are working in the Central African Republic’s capital, Bangui, while Moscow has also assumed responsibility for the president’s security detail. Moreover, Russia has, with Sudan’s assistance, actively inserted itself into negotiations between the government in Bangui and rebel groups. While several theories abound about Russian intentions, it is likely that Moscow believes that it can gain attractive mineral concessions and influence in oft-neglected capitals like Bangui for relatively little investment of its military diplomacy. Because Washington maintains little focus on Central Africa, Moscow has little to worry about, save from French concerns over its former colonial backyard. While this could change, it is likely that the United States will remain focused elsewhere and let Paris deal with Moscow’s increased interests in the area.